Succeed on the court with this in-depth guide! More than 14 million girls and women play volleyball, making it the number one woman's participation sport in the United States. Volleyball continues to grow in popularity among female athletes, attracting more and more spectators each year. 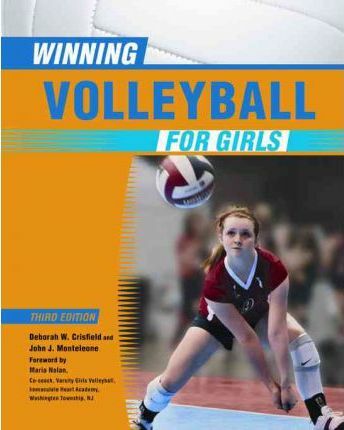 Covering the history of the game as well as exercises for training and conditioning, "Winning Volleyball for Girls, Third Edition" provides chapter-by-chapter coverage of all aspects of the game, from putting a team together and planning practices to serving, blocking, and spiking on the court. This guide now features 113 full-color photographs with real high school athletes demonstrating proper playing techniques, as well as full-color diagrams, new exercises and drills, and updates to reflect current terminology and rules. The chapters include: Training; The Serve Receive or Forearm Pass; The Set or Two-Hand Overhead Pass; The Serve; The Spike; The Block; Offense; Individual Defense; Defensive Play; and, Transition. "An excellent reference source for the young player and a solid review for a young coach... useful..." - Choice"
Deborah W. Crisfield is a freelance writer, editor, and sports coach for elementary, junior high, and high school teams. A former soccer player, she currently resides in Summit, New Jersey. John J. Monteleone is a writer, editor, and sports clinicaian, as well as Seton Hall University's only two-sport All-American athlete in baseball and soccer. He lives in Pennington, New Jersey. Maria Nolan is a co-coach for the varsity girls' volleyball team at immaculate Heart Academy in Washington Township, New Jersey.